Getting Ready for Winter with Heat Holders - Reclusive Fox ""
I always feel the cold and although I was eager for the autumn weather to appear, now it’s here I’m not quite as keen. My office is in the loft so it’s freezing up there at the minute. I know I could heat up the space if I put the heating on but I am trying to last as long as I can before I hit the switch. I have a gas meter and the central heating eats money like nothing else. The longer I can hold out the better. So when I received some thermal socks in the mail I was rather happy. I know socks aren’t the most interesting pieces of clothing but I’m a huge sock fan. When I was a child I used to raid my dads sock drawer and now I often ‘borrow’ socks from G. I love socks and I often find that means socks are just so much better. As a mother I often leave my essentials to last too so while G and Elle have a drawer full of gorgeous socks of all colours, styles and thickness, whereas my own drawer is home to more odd socks than pairs. 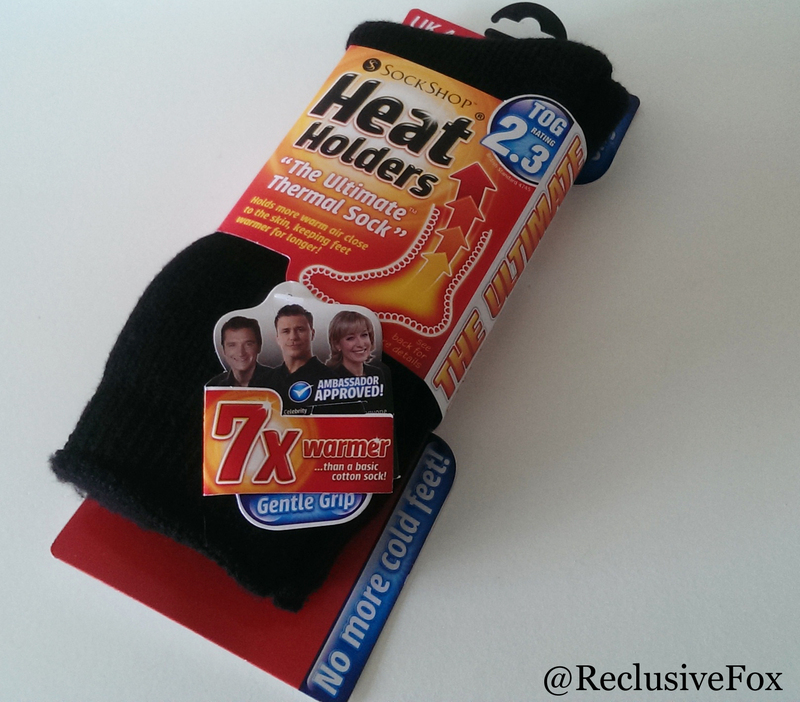 The Heat Holder socks have already done the rounds in my home. Currently they’re on my daughters feet and G was so impressed with them we’ve actually already bought him a pair, and the shopping won’t stop there. 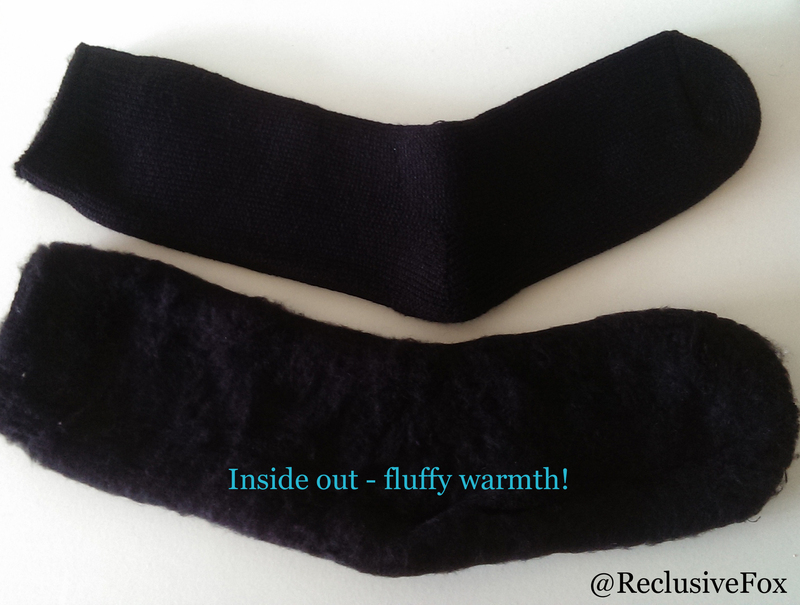 You see these are not just any old socks, they’re not just any old thermal socks either. They are super plus, extra thick, soft delicious socks that feel absolutely fantastic. The first thing you notice is how thick they are. They actually feel like a blanket or even a soft mattress! When you put them on your feet you’re next hit by how soft the interior is. It’s comfortable beyond words. Now all this coziness is one thing but do they actually work? 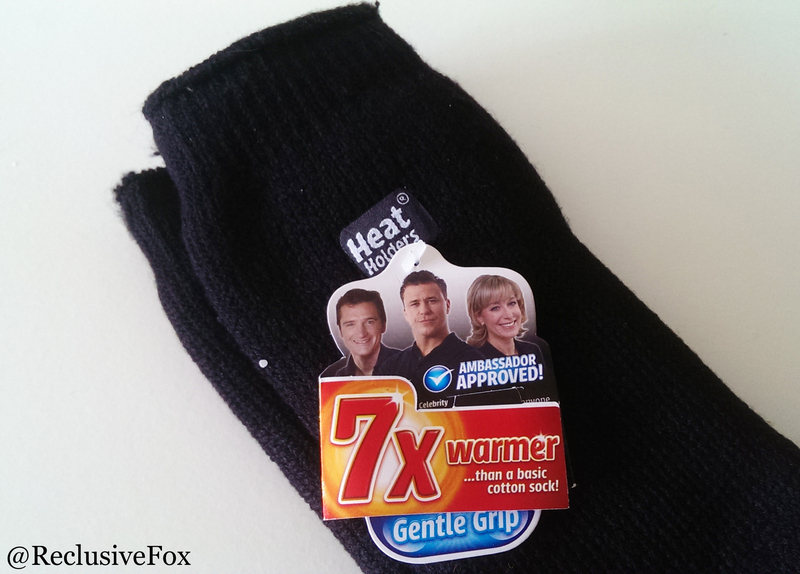 I’ve had lots of socks claiming to be thermal but all I think they really are is a bit thicker than your usual socks. So I’ve been testing out the Heat Holders thermal socks and I can honestly say that so far they do seem to work perfectly. I have worn them in my freezing office and to walk the dog in my walking boots as well as up town in my biker boots. On each occasion I haven’t had to deal with painfully cold or numb toes. They do work and they only cost around £6, which is an absolute steal if you ask me. Worth every penny. In addition to my thermal socks I also treated myself to an amazing electric blanket for on the bed. I bought my first electric blanket last year and I wish I had ventured into this world a whole lot sooner. If you’ve never had one I urge you to try one out yourself because they are amazing. The cheaper blanket had large connectors that lay at about pillow level on the bed. These little boxes were hard and in a position that made it impossible to ignore. The Dreamland blanket has much smaller connectors that are slightly further down and so far I’ve not felt them once while lying in bed. Neither has G which is the main thing as he hated our old blanket simply because of this feature. Many electric blankets tie onto the mattress. The Dreamland is basically designed like a fitted sheet and it fits perfectly over even deep mattresses like ours. Our old blanket was very thin so you could feel the wires whilst lying on top of it. 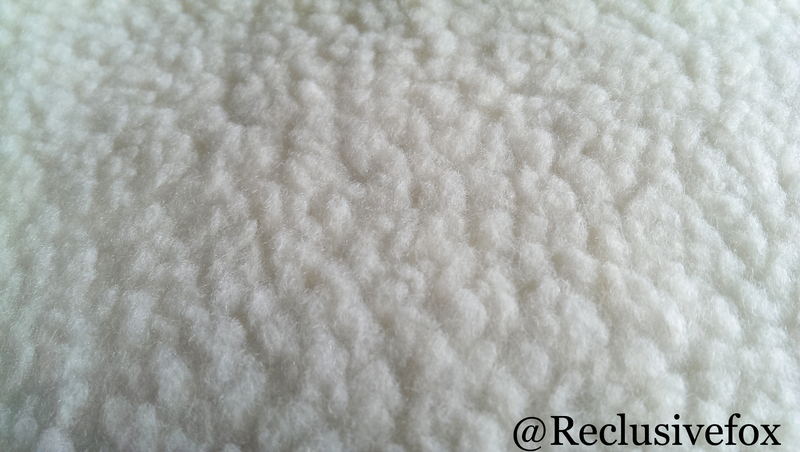 The cover is a thick fleece so you can’t feel any wires and the bed feels extra soft too. Now I feel a lot more prepared for the cold weather that’s coming. I highly recommend the Heat Holders and have my eye on their tights and leggings (so does Elle!). It’s also worth spending out on a decent electric blanket too. They help to cut down the cost of heating the home and they make the bed feel extra warm. The only downside is getting out of bed in the morning can be a bit of a challenge. Oh these do look rather warm and comfy. Like that they have fur in the inside, do they sell other colours though? Those socks look so comfy! I love the fact they have a fluffy interior. I’ve toyed with the idea of getting an electric blanket but I’ve decided to wait and see what kind of winter we get this year as last year was pretty mild! Yes lots, and different styles – wellies socks, slipper socks and so on. All really affordable too. I am keeping an eye on the UK Weather Forecast page on Facebook (best weather team out there). It’s too early to tell for sure but signs point to being colder. I’m cold enough already! I need to venture out in the land of electric blankets never dared but this cold I know will be having I need to be prepared. You won’t regret it. I wish I tried one years ago. Eu adorei essa sÃ©rie…Do primeiro ao Ãºltimo episÃ³dio. Tudo foi se encaixando e a forma como trama foi contada ajudou a gerar um clima de tensÃ£o em todos os episÃ³dios.Ter mostrado que a Patty perdeu uma filha no passado pode ter sido uma tentativa de mostrar o que a fez a se tornar a pessoa tÃ£o &#&8s0;insen2Ã­vel2#8221;… Mas acredito que na prÃ³xima temporada saberemos mais sobre isso.Ã“timo post!